A BIG Thank You from this years’ Heritage Picnic organizers! and all the volunteers from the southend community association! Latest edition of the DNBIA City Notes is out. 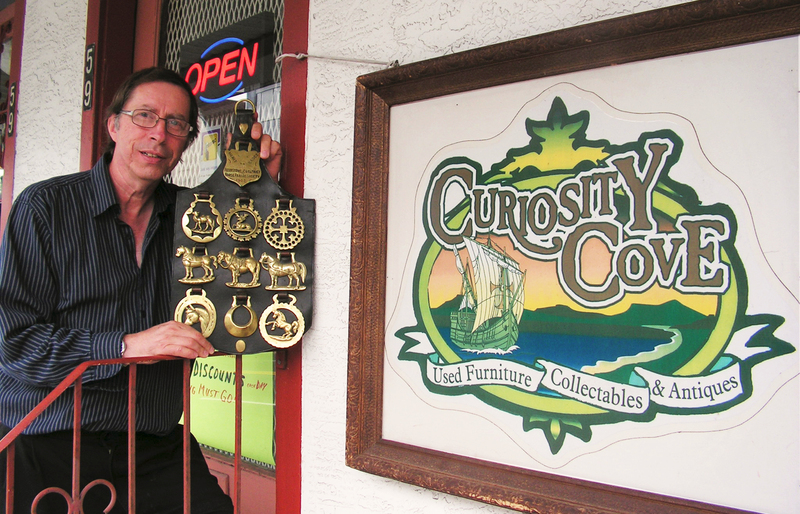 Curiosity Cove owner Gerald Gonske with a collection of Victorian horse brasses, some of his remaining Curiosity Cove stock after 30 years in business. The Nicol Street store closes August 31. Nanaimo treasure hunters seeking the unique and eclectic are losing one of their favourite stops at the end of this month with the closure of Curiosity Cove after 30 years in business. Owner Gerald Gonske, 59, cites a changing market and a recent heart attack as reasons for shuttering this old-fashioned style antique and collectibles shop, with its extensive collection of finds reaching back two centuries. The shop was founded by Gonske and his parents, Eric and Helen Gonske, in 1982. First located in Harewood Mall (now University Village), the 2400-square foot shop offered a blend of something-for-everyone, with new furniture, used furniture, antiques and collectibles. Gonske’s sister came up with the name, which captured the spirit of the shop as a browsing haven for the curious. Gonske recalls many people questioning the wisdom of starting a business during the mini-recession of the early 1980s, when many businesses were closing. “We started with $700 worth of stock in a pick-up,” he recalled. But the shop’s mixed stock proved to be popular with shoppers, some of whom remained customers for the next 30 years. In the late 1980s, the shop re-located to the current 900 square foot space on busy Nicol Street, which gave Curiosity Cove high visibility with passing vehicle and foot traffic. An adjoining parking lot was added a few years later, which made it even easier for local residents and out-of-town visitors to search the shop for treasures. Gonske recalls several highlights from the past 30 years, including providing historic tools for a museum display; unearthing documents tracing a family history back to the late 1700s; and providing buyers with vintage and antique finds dating back to the early 1800s. A member of the Canadian Personal Property Appraisers Group, he is also the secretary for The Diggers Club: B.C.’s oldest registered antique club. His favourite find was an 1840s ship captain’s desk of hand-carved burled walnut, which had an integrated pop-up bookcase and piano roll front that fit into a compact 36 by 28-inch space. Appraised at $12,000, the desk sold for $5600. Other highlights were the 16-piece hand-carved, champagne bedroom suite from Krug Brothers & Company, a venerable Canadian builder of top quality furniture established in 1880, and the well-known Steuben glassware from the U.S. company which was established in 1903. For the last few months, Gonske has been selling his inventory in preparation for the store closing as of August 31, 2012. He notes that the market still exists for some especially collectible items – he recently sold a rare teacup and saucer set for $350 – but there are fewer walk-in customers for storefront operations. The market is also flooded with vintage furniture from estate sales. In addition, many collectors have moved online, with people able to search the world for desired items. Gonske started selling online in 2007 when he joined the GoAntiques.com network. He quickly realized that online sales were the future. “This system opened the door to a whole new marketplace of knowledgeable buyers,” he said. So even when he closes the shop at 59 Nicol Street at the end of this week, he won’t be leaving the antiques he loves. And we’ll miss you, Gerald. Good luck in the on-line world. I often get some of my posts from the DNBIA City Notes. This issue has LOTS in it, including the upcoming Fringetastic Theatre Festival, which starts next week. Here’s the link, if you want to check it out. A thrift store that is open on Sundays! And in the South End! Woo-hoo! DNBIA Wins Provincial Grant for Terminal/Nicol Corridor Project! Downtown Nanaimo, Friday, July 13, 2012 – The Downtown Nanaimo Business Improvement Association has been awarded $217,500 from the Province of BC through the Brownfield Renewal Funding Program. The project, one of 24 sharing more than $1.64 million, was awarded the highest amount for the Terminal/Nicol Corridor Project led by the DNBIA’s Planning, Design and Development Committee (PDDC). As a contributing partner in this project, the NEDC is happy to see this project move forward. “The NEDC is thrilled to learn the DNBIA’s grant application for environmental testing was successful. For years, development along this critical corridor has been stagnated and this is one very large step forward. The NEDC will be a partner with the DNBIA as we work to remove obstacles for property owners; ultimately improving the downtown area.” said A.J. Hustins, Board Chair of the Nanaimo Economic Development Corporation. The Downtown Nanaimo Business Improvement Association (DNBIA) is a non-profit organization mandated to lead revitalization in downtown Nanaimo. The DNBIA is made up of twelve Board members, four volunteer committees and four staff that carry out projects and programs that will create a vibrant and successful downtown.